Opening its doors in early 2017 in Chattanooga, Tennessee, Songbirds Guitar Museum is a one of a kind treasure trove of iconic historical guitar brands and the people who brought them to life. Housed in a rustic old building completely refurbished and fortified to protect the valuable exhibits inside, this rare museum is nestled into the walking streets of downtown Chattanooga in the Choo Choo complex near plenty of restaurants and bars, bustling with people chilling out and having a good time. Inside, are glass-enclosed cases showcasing some of the most rare and valuable instruments in the world dating back to the 1920s including Fender, Gibson, Gretsch, and Rickenbacker, “all grouped by brand, timeframe, and linear progression” covering music styles from early blues, country, and bluegrass to the British invasion and surf. 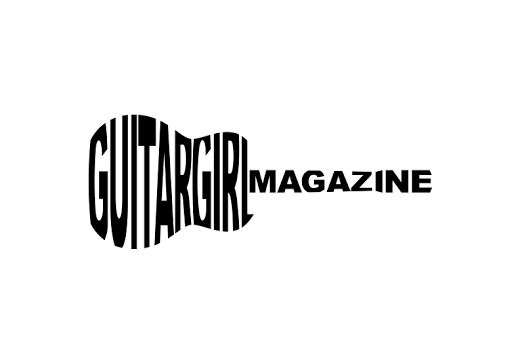 But what caught the eye of GGM was the mid-section exhibit hall referred to as the Green Room featuring the “Six String Queens,” the wonderful and talented ladies that helped kick off and grow the acoustic and electric guitar revolution for women in country, blues, and rock music! We had the pleasure of attending the opening day which included music by Jess Goggans, guitar giveaways by Fender and Gibson, and a personal guided tour. Curator David Davidson shared with us that he’s seen a recent shift in the guitar industry – today, there are more young girls and women attending music camps and buying guitars. It was his vision for this exhibit to shine a spotlight on influential female guitarists as a way to encourage young girls and women to pick up a guitar and play. Attending the exhibit that day, we met Tara Viland and young daughter, Kai, who are part of the Chattanooga Girls Rock Camp. Kai was beaming from ear to ear and thoroughly enjoyed her time at Songbirds. The Six String Queens’ exhibit honors some of the most influential women guitarists in music. Display cases showcasing the artists included photos and information about each artist. In all of these showcases lie the stories of the guitars they played. While not their actual guitars, they were original models from that time, except for Wanda Jackson’s guitar. The educational exhibit starts with Elizabeth Cotten born in North Carolina in the 1890’s. Originally a lefty banjo player, she later learned to play the guitar upside down. Her unique style of picking was nicknamed “Cotten Picking.” Cotten’s showcase featured a 1966 Martin OOO-18. Visitors then travel through different eras and multiple music styles starting with Maybelle Carter and Sister Rosetta Tharpe, and then on the ‘40s through the ‘70s with Mary Ford, Wanda Jackson, Carol Kaye, and Joni Mitchell. Across the room, the showcases continue with Bonnie Raitt, the Runaways’ Joan Jett and Lita Ford, Nancy Wilson of Heart, Chrissie Hynde of the Pretenders, Susanna Hoffs of the Bangles, and ending with Sheryl Crow. Viewing the history and guitars that helped create the sounds these women produced was truly inspiring and a “must see” for young, aspiring female musicians. Beyond the Green Room is The Vault where rare, vintage guitars filled the walls of the entire room. To preserve these beauties, they are encased in temperature-controlled glass enclosures. 1958 Gibson Flying V, original Fender Jazzmaster in a beautiful shell pink with gold hardware (I felt this one was special since this year is the 60th anniversary of the Jazzmaster), and several original prototypes from Fender are just a few of the dozens of guitars in The Vault. There was a unique story that seemed to rise above the rest, at least from a personal perspective, and that was the story of a relatively unknown duo called the Tweedledees in the late 1950s featuring twin sisters Esther and Bertha Friedlich. These twins played identical Fender Telecasters except that one was right-handed and the other was left handed. They insisted on the sunburst Tele because of the country-western appeal. 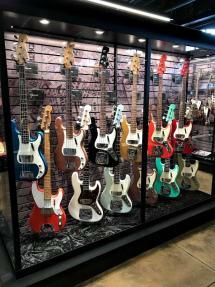 As the tour guide tells us, they had been signed to a record deal, although never recorded, and with their money, they traveled to Ful- Fullerton, California to the Fender factory to choose their guitars. As they were not identical, sister Bertha had Fender begrudgingly custom-design the guitar with a beveled back to fit her frame and have a more comfortable feel when playing. Her Tele is the only early model with that particular beveled cut in existence. The beveled back is similar to today’s Stratocaster. The compelling story is the way Songbirds acquired these two 1958 Sunburst Telecasters. Upon hearing of these guitars, Davidson was on a quest to obtain these treasured instruments. Esther sold her guitar to Davidson and at the time, told him where to find her late sister Bertha’s guitar. The daughter of Bertha did not want to part with her mother’s guitar for fear it would be sold in the open market (a high-value market indeed) just to be sold and re-sold. She preferred to keep it and her mother’s legacy intact. Davidson was persistent over the next several years sending her Christmas cards and building trust. He had assured her that his plan was not to re-sell the guitar, but to immortalize it next to Esther’s guitar in a very special museum. Finally, able to gain her trust, he was invited back to the home to purchase the guitar and was prepared to pay a handsome sum. But to his surprise, when he began to make his offer, she merely gave him the guitar trusting she had found the place that would cement her mother’s immortality; and wow, they both struck a great deal that day…what a great story! 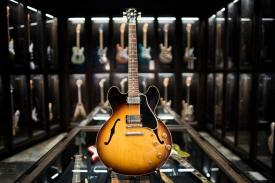 Well worth a visit to Songbirds Museum to view the most extensive private collection of rare, vintage guitars. And while you’re there, take time to enjoy the talented artists showcased in their music venue.